At first I just decided I would join the ever-growing ranks of people who publish their pets on the world wide web. 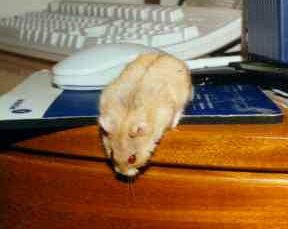 Then I thought I would expand the site to include other hamsters from the Hamsters Mailing List and some other stuff, including the Dylan Hamstery page, the mailing list itself, Houdini, the car-eating hamster (really!) and some links to various useful pet resources. And here it is! Well, at long last, after neglecting the upkeep of this site for an awful long time I've started to make some new additions. Therefore, please welcome Curtis the rabbit and Gus and Jacques the guinea pigs. Dougal, Otto and Franklin, the Russian hamsters will appear shortly, as will Cadbury and Scary, Sporty, Posh and Baby - the Mice Girls. Welcome to my new bunny! Click on Dylan to explore the Dylan Hamster Site! You can also click on the thumbnails to go to individual Dylan Site pages. 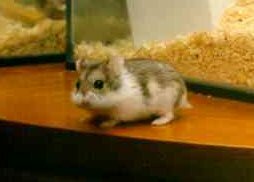 There are some links to other good hamster places below. Tabbyworld - cool new cat site! scrollbars if you're using 800x600. Forward to the first Hamster list squidgy! Background on this site copyright © June 7, 1998 Natasha Litten. Nick it and Alberta'll have your hand off!